Life’s not grim up north. The landscape is some of the most extraordinary in the world. Culturally and creatively, world-class examples abound. The foundations laid by the north of England’s industrial heritage go deep and continue to offer huge opportunity for regeneration and ongoing development. Life’s not grim up north, but the stark truth is that, on average, northerners get less time to enjoy it. Because of poorer health, people in the north of England have shorter lifetimes and suffer more years of ill-health than people in the south. This is in no way a new story: we've known it for a long time. The reasons for that poor health are varied and reveal lots of other north-south divides. People don’t just get ill because of the health services that are – or are not – available to them. People get ill because they can’t find a job, they haven’t got enough money, they feel powerless, they don’t live in a safe, clean, warm place, they didn't get a good start in life or had a poor education and because they live in a place that wasn't well-planned to live an active productive life. In April this year, as I left London after a busy day meeting new colleagues in Public Health England, I opened the Evening Standard and read a ‘good news’ story about jobs: most new jobs created in the next 5 years, according to an economic analysis, will be in London and the South East. Great news for some but other places, including many in the north, will take years to recover to where they were economically in 2008. So when I met with my new PHE centre director colleagues from the 5 centres across the north of England the next day, it didn't take us long to hatch the idea that we must work together, drawing on the resources of PHE and the assets in our local authorities and communities - North Health Equity was born. PHE's job is to protect and improve the nation’s health and address inequalities, working with national and local government, the NHS, industry and the voluntary and community sector to achieve its aims. One of its key roles is gathering knowledge, intelligence and surveillance on health and all of these outputs are clearly pointing to the impact that varied inequalities have on people’s health. One of PHE's first outputs after it was set up in April was the launch of the Longer Lives website in June 2013. This presents and compares data for the four biggest causes of early death (under the age of 75) in England: cancer, heart disease and stroke, lung disease and liver disease. It is intended to give every local authority in England a clear picture of its local health and an understanding of how it compares with similar areas. 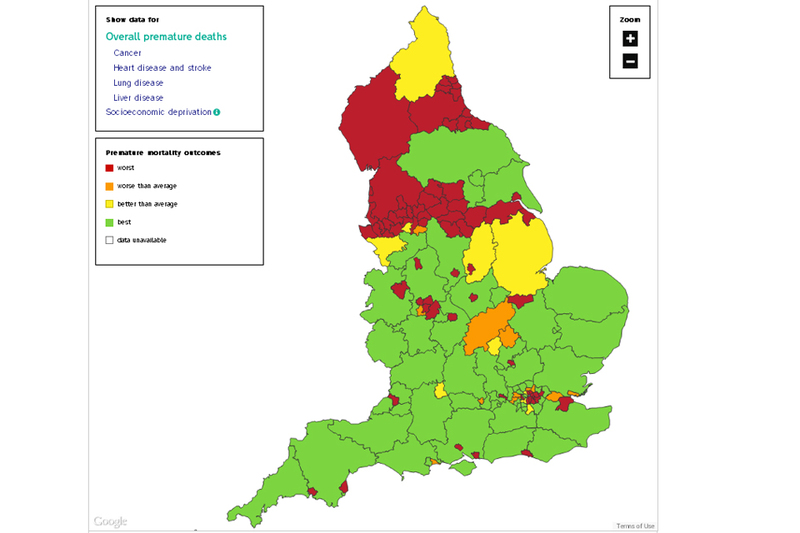 The website uses a simple red, amber and green system for showing early death rates in local authority areas and, for us in the north, the map of the whole of England simply demonstrated very clearly the division of poor health, with its sea of red across the north of England. We know this isn't new and we wouldn't dream of suggesting that PHE can somehow solve all of this alone, where others before us haven’t managed it. We've known about the issues for years. The Marmot Review, back in 2010, demonstrated how we will need to work across policy areas, places, communities and organisations to deliver a fairer health picture across the country. Individually, a whole range of organisations across the north of England have been working hard to make a difference in their own areas, long before PHE existed. However, what any organisation, or even sector, can do alone is not enough. That’s why we’re already working with some of our Directors of Public Health and academic partners across the north as we all really want to see North Health Equity bring together everyone’s collective efforts and ensure that the sum is greater than the parts and we start to see significant change in the health of the people of the North of England. North Health Equity is not a PHE project, we in PHE are simply acting as a catalyst to bring others together – Directors of Public Health, Academic partners, Health and Wellbeing boards and the private, voluntary and community sectors – to see what we can do that hasn't been tried yet to move things forward and lobby where needed – workable solutions, as well as evidence of the issues. We have issues, but we have assets as well - a large number of world-leading experts on inequalities live and work in the north already. This is about harnessing our resources, learning from one another and sharpening our impact. It’s early days, but we have some ideas. We are bringing together the huge amount of evidence that exists across policy areas. We want to set up some sector-based collaboratives bringing together common interest groups. These collaboratives would identify and support activists and other influential figures to get involved North Health Equity, as well as advocating for it themselves. The collaboratives would also look at the potential impact of policies and initiatives on their sectors and advise on systematic implementation of solutions across their respective spheres of influence. This is a journey we need to set out on. Everybody benefits with a reduced north- south divide - whatever the individual arguments about economics or infrastructure. Dying years before the average life expectancy and suffering ill-health for more years of life has to be the ultimate inequality. And so, if PHE is going to achieve what we've been set up to do, we have to start to do what we can to get a fairer health deal for people in the north.